Pasta for dinner at Italian Kitchen from The Glowbal Collection on Alberni Street on March 12, 2012. 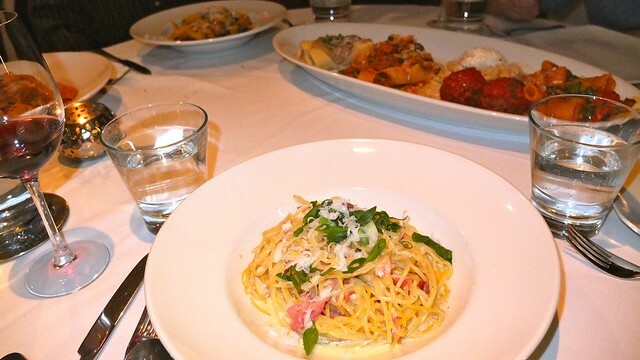 We hopped down to the Alberni Street corridor for some pasta at Glowbal's signature ristorante Italian Kitchen. 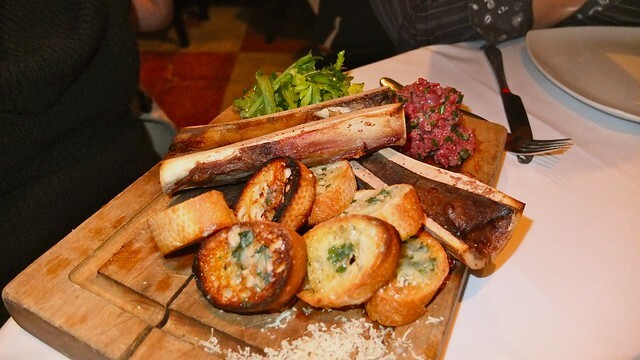 The bone marrow beef tenderloin tartare with garlic crostini and beef carpaccio was savoury well-presented. It was a solid, ample filling appetizer. 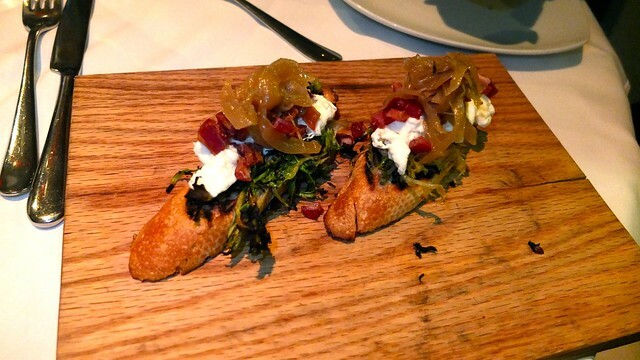 The burrata with bacon, marinated escarole, and caramelized shallots was not as expected. Very top heavy, the toppings overwhelmed the bread slice when bitten into. I ordered the linguine carbonara with pancetta, scallions, free range egg, and parmesa. It was well-cooked and satisfying. The sauce was just the proper consistency with a savoury flavouring. Ange and Kevin split the pasta platter of spaghetti (with spicy kobe meatballs and truffle cream), braised veal cannelloni (with wild mushroom cream), pappardelle (with lamb sausage, cabbage and potatoes), and rigatoni pomodoro. 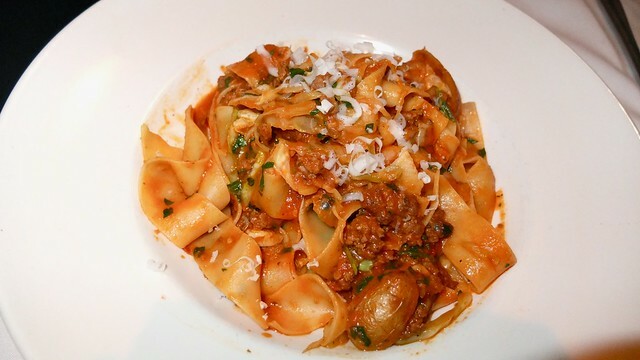 I was jealous of Grace's pappardelle with lamb sausage cabbage, potatoes, peperoncino, and olive oil. It was quite delicious and delightful. 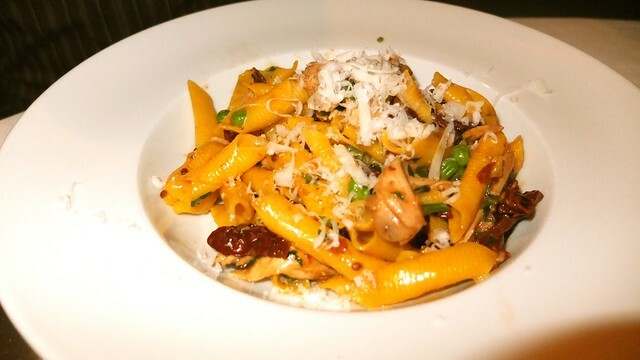 Also, Bennett's garganelli pollo with roasted chicken, sun-dried tomatoes, peas, and roasted chicken broth looked fetching and quite edible. 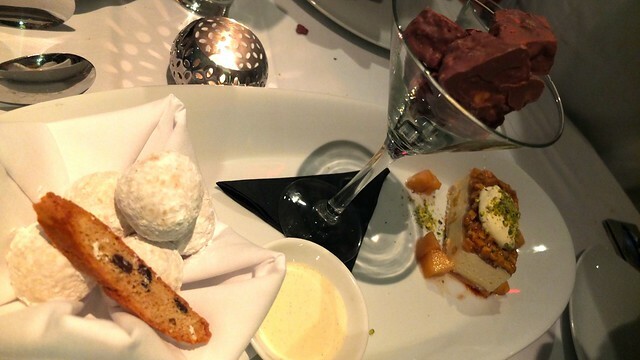 We were treated to complimentary desserts of zeppole ci cioccolato (Italian style doughnuts, with chocolate ganache crème anglaise), crostata di ricotta (sweetened ricotta tart, apple and candied pear cinnamon tuli), and Crunchie style chocolate bars. It was a very satisfying meal all around. 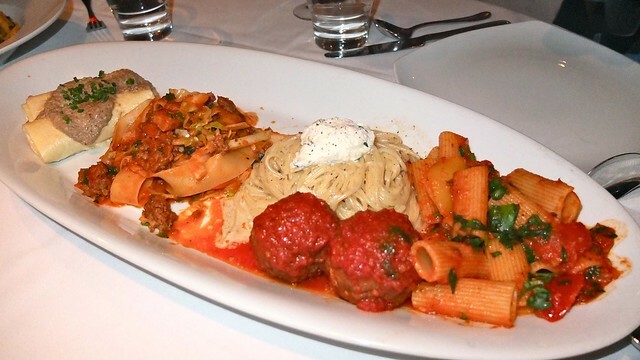 We enjoyed our night of pastas with good service and atmosphere. How much was the total bill for this? We got separate bills. 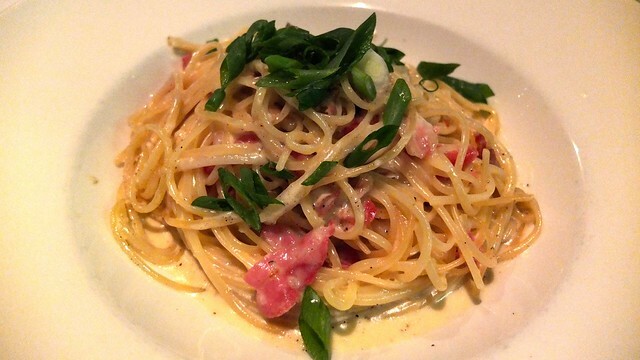 All prices are available on IK's website/menu, usually between $16-19 for pasta dishes.